We are licensed, insured and specifically approved for transportation to and from Port Canaveral and Orlando International Airport. Also Sanford airport to and from Port Canaveral and Cocoa Beach. One to Ten Passengers With Luggage. The following rates reflect shuttles to a few popular central Florida destinations. Custom trips can be arranged so please Contact Us for rates. Travel Times are highly dependent on traffic conditions so be prepared for delays! One Way - $40 per passenger. 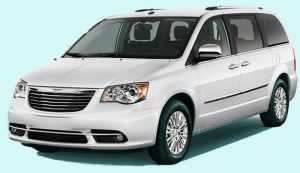 Round Trip - $75 per passenger. One Way - $35 per passenger. Round Trip - $65 per passenger. One Way - $25 per passenger. Round Trip - $45 per passenger. Round Trip - $55 per passenger. One Way - $65 per passenger. Round Trip - $110 per passenger. Round Trip - $80 per passenger. One Way - $30 per passenger. Round Trip - $60 per passenger. We appreciate our customers and we value your comments. If you would like to share a comment about your experience with Airport Shuttle Service, please Let Us Know. My friend and I traveled down to Disney earlier this year and used the Airport Shuttle Service. Wayne was our driver and both my friend and I raved about the exceptional service we received!! I highly recommend their services if you are searching for shuttle service! I will definitely be using them if I ever need to in the future! Hi Wayne! I just wanted to say a huge THANK YOU for taking such good care of my customer Lisa & her daughter! I just heard from her today and just found out there was a problem with her incoming flight not arriving on time, she couldn't say enough good things about you and was so happy she had you for her shuttle. I will definitely use your services again for my clients in the future, and I will be sure to leave a positive review for you on trip advisor also. I can't say enough about the awesome service my boyfriend and I received from Wayne. He went above and beyond to accommodate us with our flight delays and separate airport transportation. In my opinion, there's no other shuttle service to call. Thank you, Wayne. You have customers, and a friend, for life. I just wanted to say thank you so much for your services this past week. We really enjoyed having you, and we'll definitely be using you again the next time we're in the area! Thank you for being flexible when our flights got changed. We really appreciate you! Christmas Cruise Family Vacation started out as a 8:40am flight that should have left Atl Airport turned into 1p.m. delayed flight leaving Atlanta due to weather. We had a to reach our Cruise Ship by 3:30pm for departure. Mr. Wayne Sturman contacted the Cruise line repeatedly for us updating them on our progress. Mr. Wayne Sturman waited at the Orlando Airport until we reached the Orlando Airport and safety got us to the ship by 4pm where we had Supervisors waiting to assist us on board. I would like to say Thank you for you faithful and courteous servis. God Bless. Just wanted to let you know how much we appreciated you transporting us around Orlando. You couldn't have been kinder or more accommodating. We are from England and have now used Airport Shuttle Service on two occasions this year. We would not hesitate to recommend this service as it has been very reliable. Wayne has taken us from Orlando to Port Canaveral and also collected us from Cocoa Beach and has always been very helpful prompt and got us to our destinations safely and on time. So many thanks Wayne and we will be it touch when we return for our next holidays in Orlando. Just wanted to compliment you for the great service we received from Wayne-very efficient and hassle free! Will definatelly use again in the future-very reliable,honest and great rates! I am very impressed with the prompt and professional sevice by Wayne. He came and picked up me and my daughter to and from the orlando airport. Boy, was he on time. I recommend his services to each and everyone, you will be satisfied with his couteous service. We always select Airport Shuttle Service as our first choice when we schedule a cruise from Port Canaveral. The drivers are terrific and the vehicles are safe, roomy and comfortable. Just wanted you to have a big THANK YOU for taking good care of our children and grandchildren to and from the Disney Dream. I appreciate you and will certainly recommend you to my clients. Airport Shuttle Service was established in 2009 to provide cost-effective, reliable, and comfortable transportation between the Cape Canaveral area beaches and the Orlando area. High quality service to our customers is our first priority. We make every effort to exceed your expectations by using the best equipment, offering several daily routes, and hiring safe, courteous, and helpful drivers. We appreciate your business and we invite any comments or questions you may have about our service. Please let us know if you need information about Airport Shuttle Service. Please see our Tripadvisor reviews.